In recent years, wind energy has become one of the most common renewable energy sources, leading the transition away from fossil fuels. The industry has been moving forward relentlessly throughout innovation and change, thus improving its competitive cost, and an assertive policy of developing renewable energies by governments. Wind turbine prices have fallen by almost a third since 2009 due to enhancements in turbine technology and onshore wind is now a competitive source of electricity compared to nuclear, coal or gas. Moreover, wind power costs are expected to decline even further, averaging 26% to 35% by 2025. Environmental benefits are also associated to this trend. Water is an essential ingredient for energy production processes and wind power requires none. Additionally, doubling the share of renewables would also decrease harmful emissions from pollutants. Furthermore, green energy would eventually contribute to mitigate climate change, a worldwide problem that needs to be addressed, and will have a positive impact in the labor market by reducing the level of unemployment since renewable energy requires more people per unit of electricity than oil or gas. Wind power demand is rapidly rising in practically every corner of the world, pushing the wind towers to evolve in size & type, from onshore to offshore towers, increasing the electrical capability from 4 MW up to 8 MW. Consequently, a big share of the electricity will most likely be produced by facilities located offshore, where winds are stronger and more reliable. One of the main differences between onshore and offshore towers, besides the diameters and thicknesses of the sections, is the need to connect the offshore tower to the seabed using a dedicated foundation system, a basement made of different designs, which anchor the tower to the seabed. 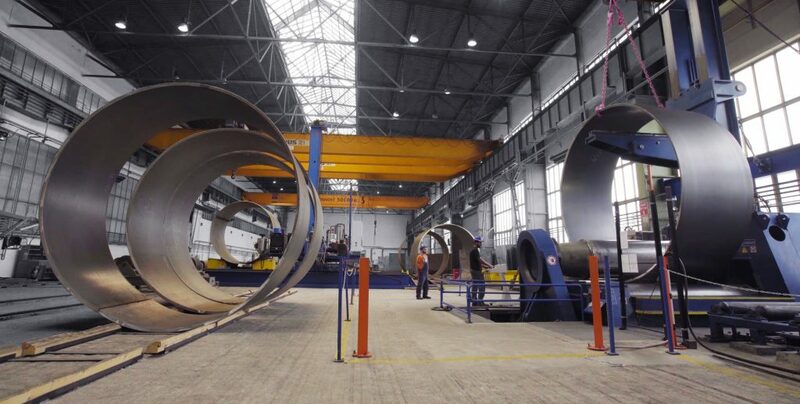 As a result, bigger and safer structures must be built, turning the foundations fabrication into one of the key production processes related to the wind tower market. In the wind power industry, there are different kinds of foundation types and the choice of the structure usually depends on the water depth and the seabed composition (rock, sand…). Foundation types are either determined by the specific resistance of the seabed (usually a sandy seabed requires more complex structures) or by minimizing the impact on the ocean ecosystem (some foundations have higher impact, during the installation phase, on the ocean flora and fauna). The most common foundation types currently used in the wind tower business (Wind Europe 2017) are monopiles, which represent approx. 81.7% of all installed substructures in Europe, Jackets, close to the 6.9% and Gravity base foundations with almost 6%. The rolling capacity demanded for tower production, for instance, is different compared to foundations production; additionally, different foundation types also have different requirements. Bending hundreds of cans per month can ONLY be accomplished with a rolling package which combines a powerful super-sized plate rolling machine with key components like a strong side support, a sturdy top support and a feeding table with alignment device, all accessories controlled by a highly advanced fully-programmable CNC designed to automate the most complex rolling projects. The feeding table can be horizontal or tilting type and its function is to support the plate during the first pre-bending. Cutting production time is possible by using a Smart Feeding Table. This table works independently from the rolling machine so it is possible to save about five minutes per each can to be rolled, saving substantial time considering the entire cycle time is about 15-20min. When connected to the CNC, it will be capable to calculate the plate misalignment and to reposition the plate during the rolling cycle in order to have an automatic cone bending. Rolling conical shapes is not an easy operation and having the plate edge aligned at the end of the rolling process is very important for a fast tack-welding operation. The best Plate Rolls manufacturers install additional clamps on the side supports that can pull together the plate edges while correcting the misalignment due to the cone shape. Another major device, part of the Automation System, is the top support, fundamental to support the plates and to prevent the can from collapsing because of its weight. The top support must be tiltable in order to have perfect contact with both conical and cylindrical shapes. All these powerful handling devices must be connected to the CNC which synchronizes them together by creating a unique system optimized to roll wind towers with the maximum accuracy in the shortest time possible. Further than just controlling over 20 axis, CNCs nowadays must be capable of supporting the companies with different functions. The CNC PGS-Ultra, tested for this article, supports operators with Graphical simulations of the rolling process, a feature that gives certainty to the operation by seeing before what is going to happen. The CNC should also provide real time information for the maintenance and the monitoring of the production, a key point of Industry 4.0, that allows top managers get access to reporting apps now available on ITunes or Android like Faccin’s Management Control. 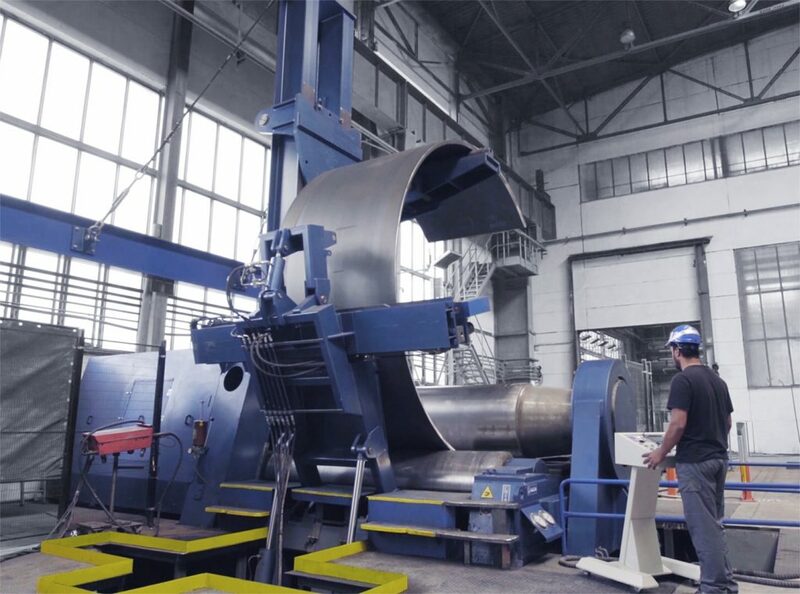 In addition, the use of Wireless Controls is becoming a common practice when rolling plates in high capacity machines due to the flexibility it gives to the operator. A reliable plate roll must always perform under heavy loads and in a field where speed is as important as accuracy, the rolling machines, must have a super-fast hydraulic system like the Faccin Advantage Package that consists in +50% movements speed, simultaneity of the movements and micro-positioning in order to reach the floor-to-floor production time of 20min per rolled tube with the best accuracy. The rolling machines’ geometry and controls must be planned to reach the tightest tolerances and to minimize the re-rolling percentage of the cones that is a common problem on the lower quality plate rolls. Thanks to its long experience, FACCIN SPA provides a dedicated customized package for every requirement related to the rolling of cans for towers and foundations: its WIND TOWER AUTOMATION SYSTEM, a purpose-designed package available for the most exigent producers looking for reliability, speed, accuracy and costs reduction.